Oil prices trickled down on Jun 6, with the U.S. benchmark crude registering its lowest finish in almost two months. The decline in oil prices can be primarily attributed to a surprise increase in weekly U.S. crude oil inventories. Yet, oil has been one of the best performing sectors over the last few months and is poised for growth. Understandably, geopolitical tensions have kept oil prices in focus over the last few weeks, with the United States imposing sanctions on Iraq. Moreover, a deep economic crisis in Venezuela has pushed oil production down, with its ports struggling to ship enough crude. So much so, that crude oil exports from Venezuela are almost a month behind schedule due to a backlog in the country’s ports. That said, oil prices have been rising over the last few months, which makes for a good time to invest in oil stocks. Oil prices fell unexpectedly on Jun 6, on reports of a rise in weekly domestic crude inventories. The WTI Crude Oil declined 1.2% to end at $64.73 per barrel, registering its lowest finish in almost two months. Also, the benchmark Brent Crude oil fell 0.7% to settle at $75.36 a barrel. Moreover, the Energy Information Association (EIA) figures reflect a huge jump in U.S. oil production, escalating 2.1 million barrels for the week ended Jun 1. Crude oil production touched a new weekly high of 10.8 million barrels a day, which is almost close to making United States the world’s biggest crude oil producer. The rise in supply may compel OPEC members to go against plans of increasing production by a million barrels. Crude oil has been performing well over the last few months with the S&P 500 Energy Select Sector SPDR (XLE) growing 12.1% in the last three months. On a year-to-date basis, the sector has grown 5%. Geopolitical Tensions to Boost Prices? Growing geopolitical tensions have brought crude oil back in focus again. Earlier last month, President Donald Trump withdrew from the 2015 Iran nuclear deal and imposed sanctions on that country. This immediately led to fears of a rise in oil prices. Imposition of sanctions means Iran could cut down on its oil production thus impacting oil exports. Moreover, United States’ sanctions over Venezuela coupled with that country’s ongoing economic crisis could further impact oil prices. Venezuela is embroiled in an oil supply crisis, with a delay of nearly a month in delivering oil to its customers from its main export terminals. The crisis comes at a time when OPEC is maintaining production controls that it has put in place since last year. The recent fall in oil price might just be temporary as data shows a surprise climb in weekly domestic crude inventories. Given this scenario, it makes good sense to invest in crude oil stocks. However, picking winning stocks may be difficult. We have narrowed down our search to the following stocks based on a good Zacks Rank and other relevant metrics. Wildhorse Resource Development Corp (NYSE:WRD) is an oil and natural gas company. It focused on the acquisition, exploration, development and production of oil, natural gas and NGL. The company has a Zacks Rank #1 (Strong Buy). In the last 60 days, six earnings estimates moved north, while none moved south for the current year. The Zacks Consensus Estimate for earnings has moved 24.8% up in the same time frame. Wildhouse Resource Development Corporation has expected earnings growth of more than 100% for the current year. Anadarko Petroleum Corporation (NYSE:APC) is one of the world’s largest independent oil and gas exploration and production companies. The company has a Zacks Rank #1. In the last 60 days, 14 earnings estimates moved north, while none moved south for the current year. The Zacks Consensus Estimate for earnings has moved 59.6% up in the same time frame. Anadarko Petroleum has expected earnings growth of more than 100% for the current quarter. Occidental Petroleum Corporation (NYSE:OXY) is an international oil and gas exploration and production company with operations in the United States, Middle East and Latin America. The company has a Zacks Rank #1. Bonanza Creek Energy Inc (NYSE:BCEI) is engaged in the acquisition, exploration and development of onshore oil and natural gas properties in the United States. The company has a Zacks Rank #1. In the last 60 days, two earnings estimates moved north, while none moved south for the current year. The Zacks Consensus Estimate for earnings has moved 34.5% up in the same time frame. Bonanza Creek Energy has expected earnings growth of more than 62.7% for the current quarter. CNOOC Ltd (NYSE:CEO) engages primarily in the exploration, development and production of crude oil and natural gas offshore China. The company has a Zacks Rank #2 (Buy). In the last 60 days, two earnings estimates moved north, while none moved south for the current year. The Zacks Consensus Estimate for earnings has moved 1.4% up in the same time frame. CNOOChas expected earnings growth of 83.3% for the current year. Here’s another stock idea to consider. Much like petroleum 150 years ago, lithium power may soon shake the world, creating millionaires and reshaping geo-politics. Soon electric vehicles (EVs) may be cheaper than gas guzzlers. Some are already reaching 265 miles on a single charge. With battery prices plummeting and charging stations set to multiply, one company stands out as the #1 stock to buy according to Zacks research. It’s not the one you think. 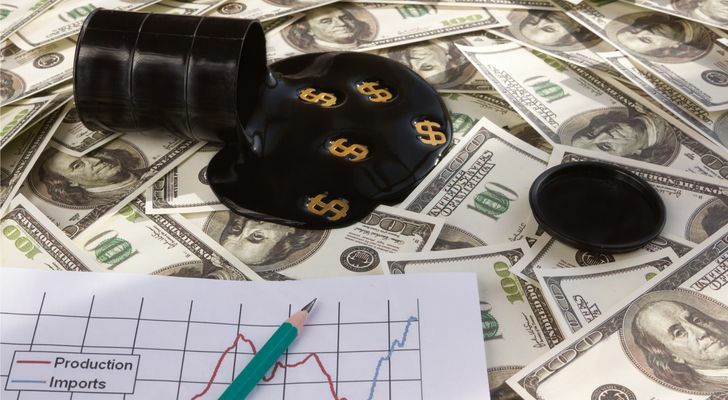 Article printed from InvestorPlace Media, https://investorplace.com/2018/06/5-oil-stocks-buy-geopolitical-tensions-boost-oil-prices-ggsyn/.